Mountains, forests, water – those words sum up Western Washington. Summer is short and everyone rushes to take full advantage. Boaters take to the lakes and Puget Sound. If you’re in Seattle in summer, visit the Ballard Locks and watch a parade of boats of all kinds travel between Lake Washington and the Puget Sound. Visit the salmon ladder, too. It’s a Seattle thing. I have always wanted to sail. 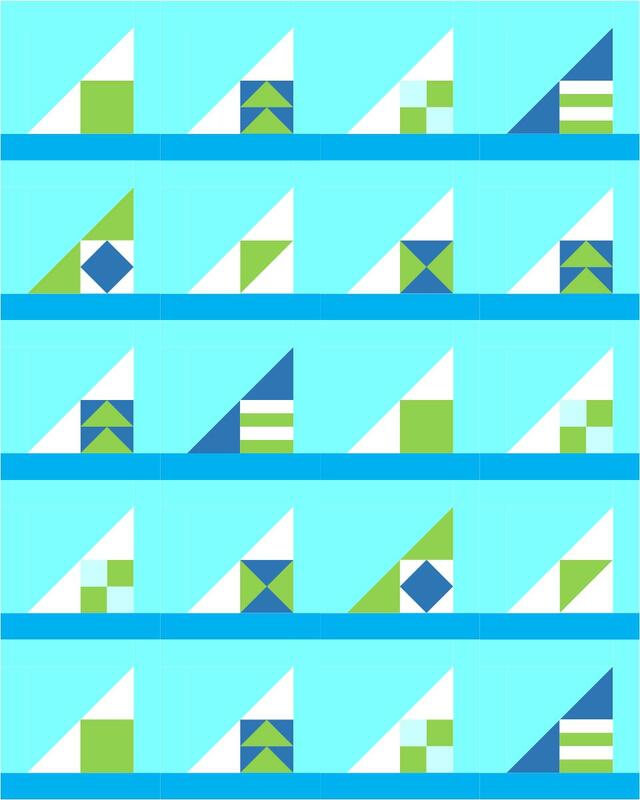 So, when the mentors of the 2015 New Quilter Bloggers gave us a chance to design a summer theme block for the Fabri-Quilt New Block Blog Hop, sailboats came to mind and Regatta was born. Our mentors worked with Fabri-Quilt to provide us fat-eighths of their Prairie Cloth Solid fabrics, in a palette dubbed “Watermelon Summer Color Palette”. I of course, gravitated toward the blues and green so prevalent here in Washington. The square patch is a wonderful place to customize your block. You could feature a favorite print or motif. Or, you could do as I did and start playing with classic quilt blocks. A 4-inch finished block is all you need to add pizzaz to your block. 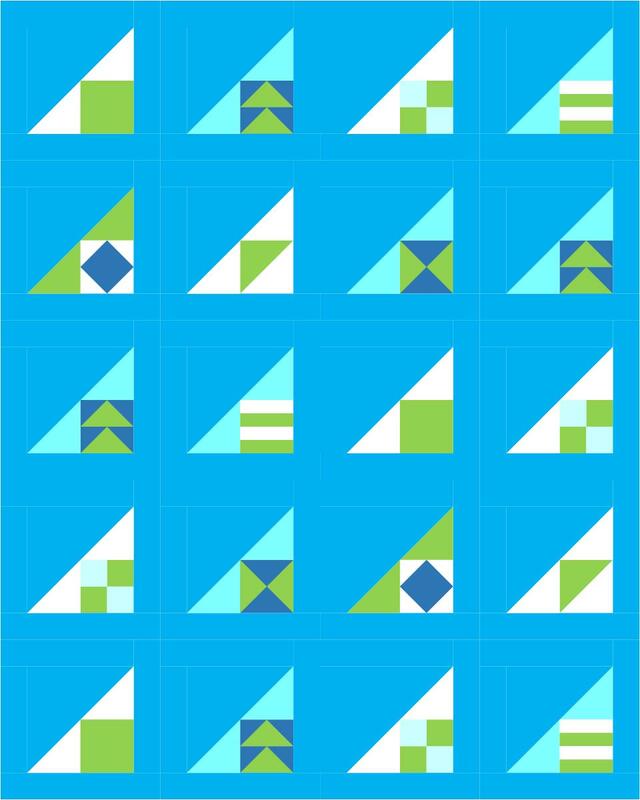 For something completely different, what if you rotated the blocks 180 degrees and created a bunting? That’s another variation to play with! And for another option, use an alternate grid with plain alternate blocks to scatter the boats across the water. Wanna make a Regatta block of your own? It is a simple but effective block and I hope you enjoy it. Download the instructions here. Who doesn’t love a tip? Always pre-wash your fabrics. Pre-washing can help with shrinkage and bleeding. I know it’s a pain, but I’ve been grateful that I pre-washed on more than one occasion. 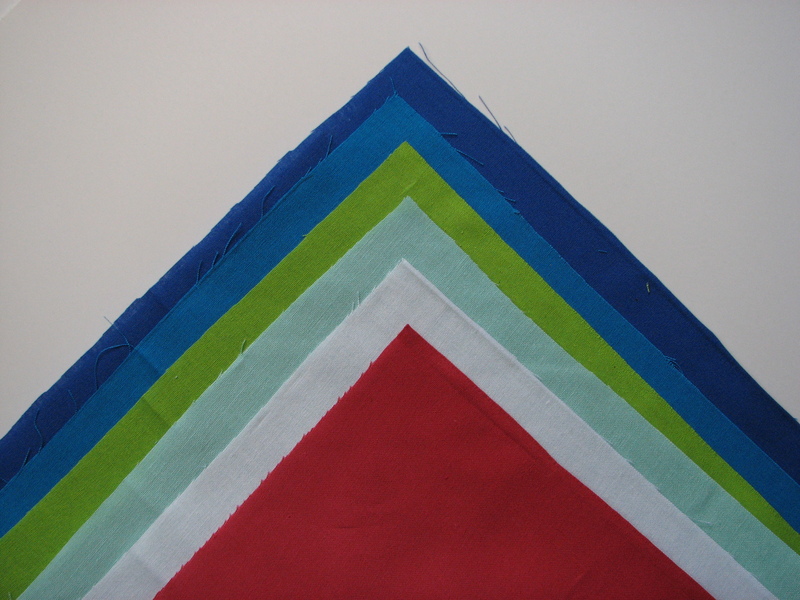 For accurate half-square triangles (HST), I like to use the “diagonal seams” method with oversized squares which are trimmed to size after piecing. This method creates two HST blocks. 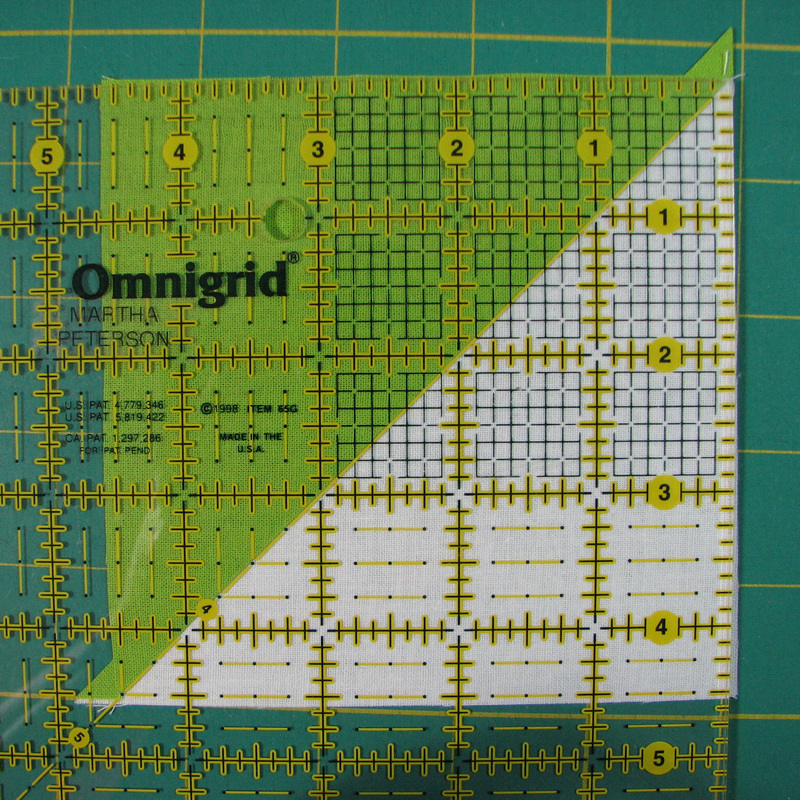 To get started with the diagonal seam/trim method, cut two squares the finished size of your HST + 1-inch. For Regatta, the HST finishes at 4 inches and you need to cut two 5-inch squares (4-inch finished + 1 inch = 5 inches). 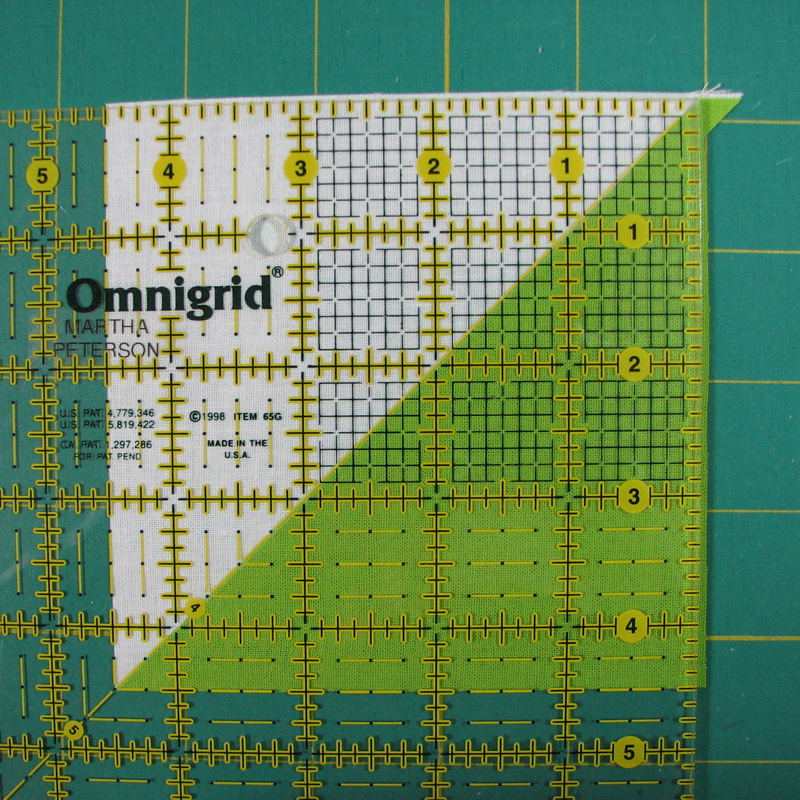 Draw a diagonal line from corner to corner on the wrong side of the lighter fabric. 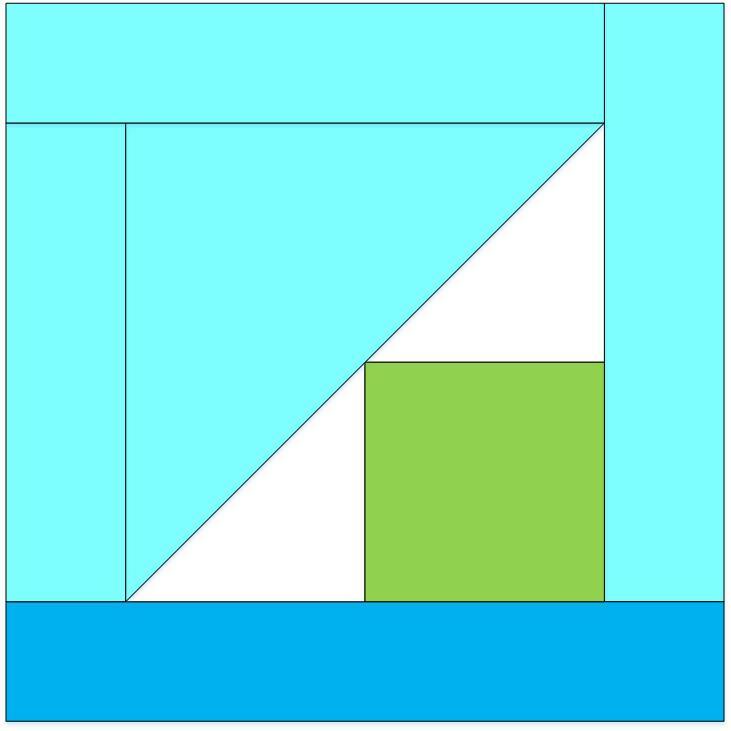 Put your two squares right sides together. 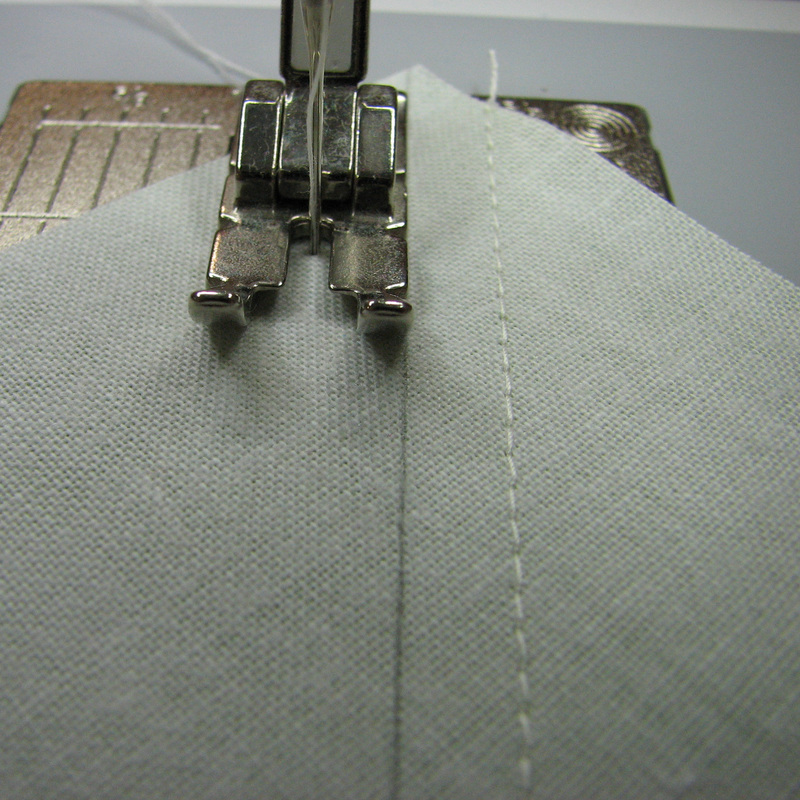 Sew 1/4-inch on both sides of the drawn line. Cut along the drawn line to create two HST blocks. Press the each block open with the seam allowance toward the darker fabric. The block will be slightly oversized and needs to trimmed. Grab your rotary ruler and align the 45 degree line along the seam. 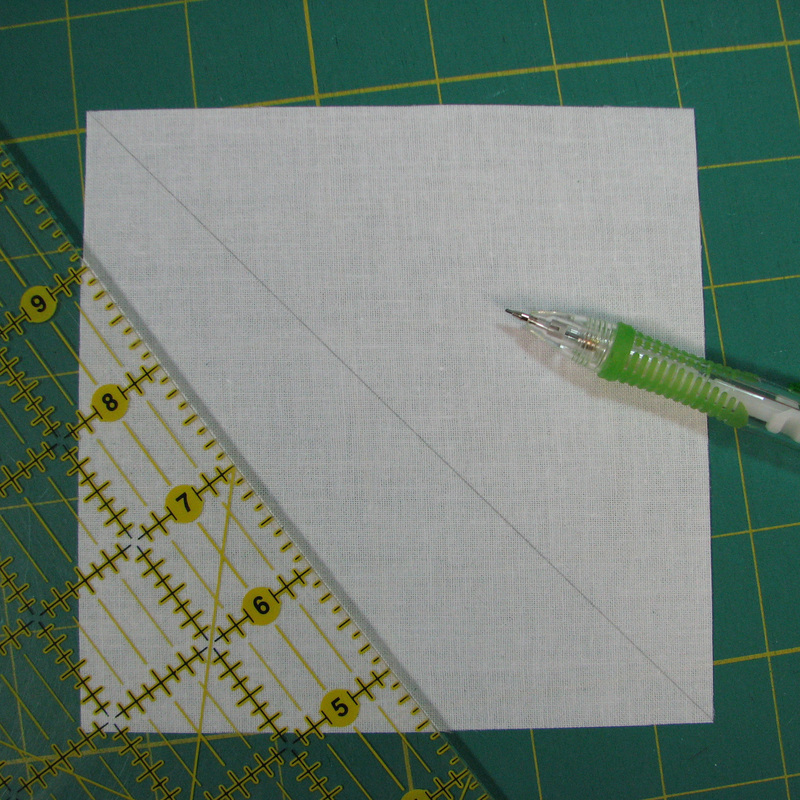 Position the ruler so you can trim the block to 4 1/2-inch x 4 1/2-inch. Trim two sides. 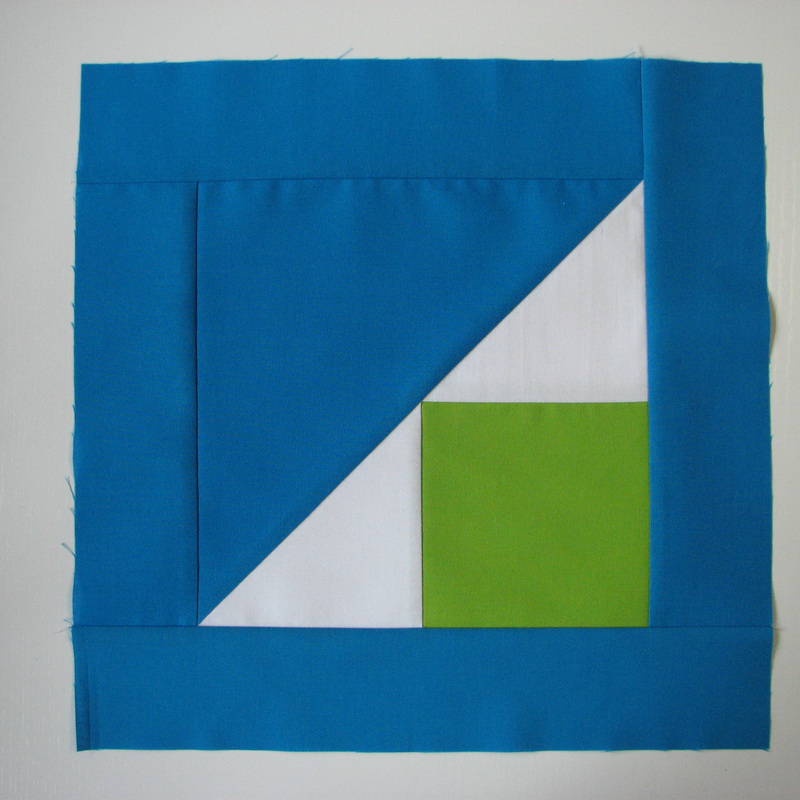 Rotate the block, align the ruler on the cut edges and diagonal seam. Trim the remaining two sides. Tada! One perfectly sized 4-inch finished HST. In case you’re wondering what is going to be done with these blocks, all the makers are mailing them so they can be made into quilts to be given away. Pretty cool. 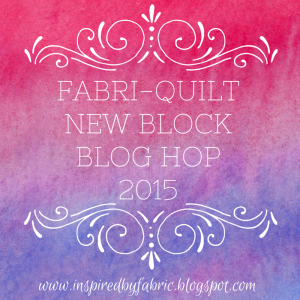 Thank you, Fabri-Quilts for the fabric and the challenge! 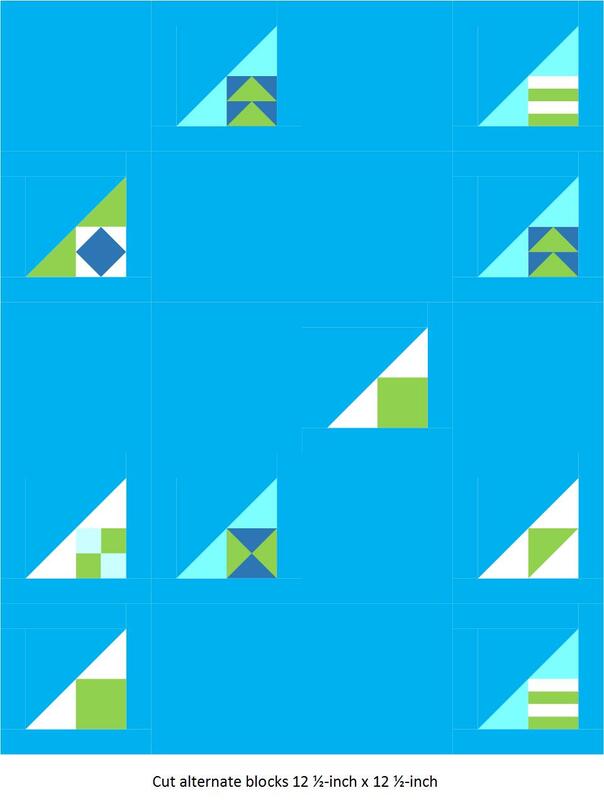 I really love how the block itself looks like a sailboat sail and can be “customized” with different unique 4″ blocks. I am so excited to get all the blocks together into a charity quilt. Awwwww, thanks Yvonne! It was a fun block to work on and once I started in on the pattern drafting, I had a hard time stopping. You and all of the hosts have been so generous with your time and advice. Thanks so much! It is so clever to encourage everyone to customize the central square to really make the block their own! I would love to see this block (with all of its potential variations) in a finished quilt. What a fun way to add interest! Thanks, Cassandra! I’ve got a friend expecting a baby boy mid winter. I just might have to sew up some blocks into a baby quilt. Love the block designs and how you customize each one. It’s going to be one awesome quilt when done. Sooooo imaginative! And I lreally like the way your post is written and organized…..
Great concept and love the colors you used! They really work together to bring the regatta feel to life! Really fun and different design – love this! Thanks for sharing! I love that the block can be customized so easily and that they do look like little sail boats in the water. I think it would be a great block for custom free motion quilting to add to the boats on the water theme. Great tutorial. I love the little sailboats. This made me miss Washington even more. I lived in Olympia and loved checking out all the boats. Very cute block and love that it’s easy to customize. Before moving to Central Florida, we lived in the Seattle area (Issaquah and Snoqualmie) and my husband and I both miss it very much. This block definitely has Seattle/Puget Sound written all over it. Great job! Very nice, and of course I love the palette you worked with! This is fabulous! I feel the wind in my sails! I love that therre are so many options…yep…customizing! Awesome! Thanks for sharing in the Blog Hop! This is fantastic. My favorite arrangement is the first picture with the boats all in a row. It rlly give off a great nautical feel. Wonderful post! Clever clever girl! I love it. I really love the layout with all the negative space and randomly placed blocks. Excellent! Great ideas for customizing a simple block so each person can be creative. Great quilt layout ideas too! This is such a fun block! I love how it can be customized so each boat is different, and the many different setting possibilities could make for a lot of fun quilts. I like the way you changed each block. It adds a lot of pizzazz to your quilt. Thank you for sharing your great blocks, layout, tutorial and tips which are always useful. Have a wonderful creative day! What a fun block! I love that you can customize it to make each sail boat unique. Martha, this is awesome! I love all the options with your block. And of course I remember meeting you at QuiltCon! 🙂 Great job! I love how you provided different project ideas for your block. I also love how you tied it into what summer is like in your part of the world. Makes me want to jump right in the water somewhere. Perhaps I’ll impose on my cousin who lives in Seattle or the one on Whidby Island. Looks great! I’m impressed by the graphics; is this EQ7? 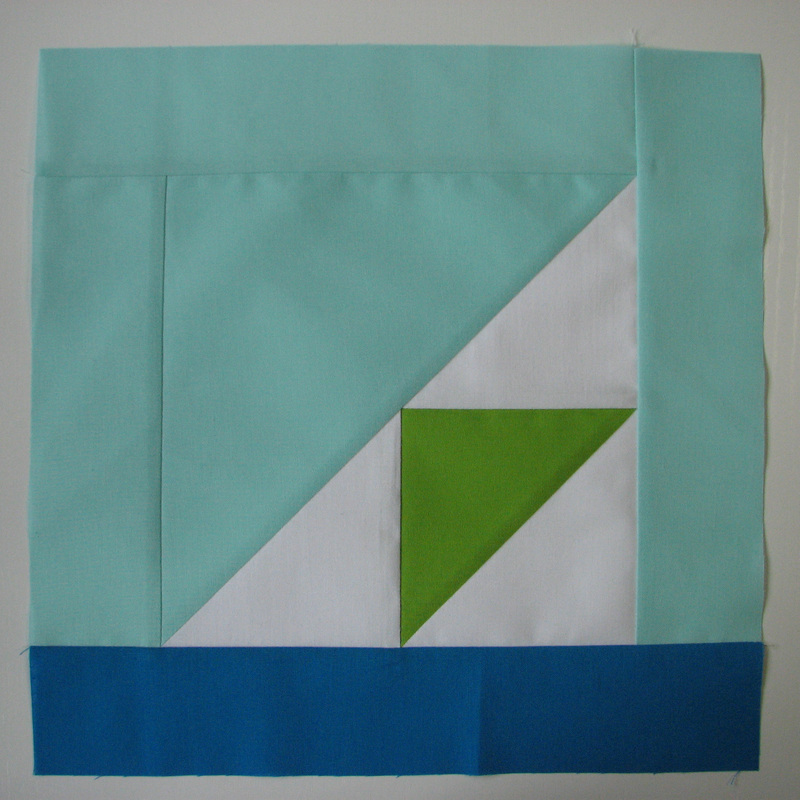 I have been wanting to make a baby quilt using Regatta flags for awhile now (pinterest can verify). I love this interpretation! Seriously. So creative yet so minimalistic. Can’t gush enough! Love your sailboat design Martha. I, too, thought of sailboats; but went a totally different direction. Great pattern ideas! Love it! What an awesome and versatile block! I like how you can make it your own in each 4 inch section. I’ve been to Seattle and watching the salmon ladder was interesting. This makes me want to go sailing! Great ideas Martha. Thank you so much for the tutorial. There is a couple of sailors in the family so will have to make a gift for them using your generous input. I have been going through a total sailboat thing lately so this totally calls to me. I really enjoy the variations you presented too, blocks within blocks are fun and a sailboat is a great way to show off some 4 inch-ers! Hi Martha, I wanted to thank you for commenting on my blog post for the hop. I tried responding to your email but it kept getting kicked back. I too like to make my HSTs bigger so I can trim them down to size. My favorite tool for that is June Tailor’s HST/QST ruler. It’s awesome! BTW, meant to ask where in the PNW area do you live? This is wonderful. I love the customizable block idea. It’s not something I come across often. This is great! I love the ocean and lived by it for 20 years. I want to move to someplace near the ocean again soon! There is nothing better than the smell of the ocean breeze. Excellent way to express our Summer theme! Love your flags, and nicely done tutorial here. Thank you for a fun block.